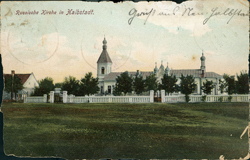 Description: Alexanderwohl church; on the back is hand-written "No. 2197-F"
Description: Landskrone church; photo of a photo? Description: Interior of Mennonite Brethren church, Tiege. 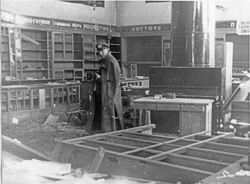 The church had been redone into a store. 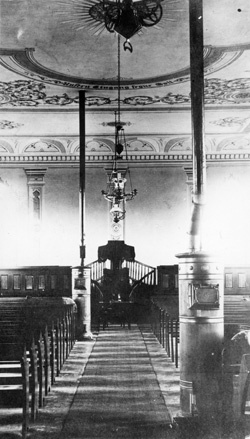 Note piano right center. Used in Mennonite Life, January 1949, p. 24. 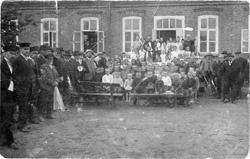 Note probably added by Horst Gerlach states that the person in the photo is Eugen Dürksen, a Russian Mennonite who became an interpreter for General Vlassov. See also Horst Gerlach, Die Rußlandmennoniten, Ein Volk unterwegs (Kirchheimbolanden (Pfalz), Gerlach, 1992), 92. Description: Exterior of Mennonite Brethren church, Tiege. Church was used as a store. See Mennonite Life, January 1949. Description: Mennonite church, Köppental, Trakt. 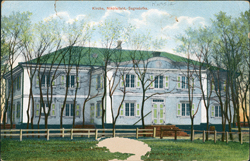 Built 1866. 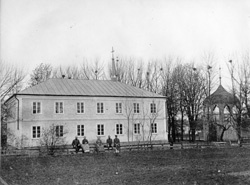 Description: Church in Kalinowo; copied from a published source, but where?